LONDON--(BUSINESS WIRE)--Technavio’s latest report on the global sorghum market provides an analysis on the most important trends expected to impact the market outlook from 2017-2021. Technavio defines an emerging trend as a factor that has the potential to significantly impact the market and contribute to its growth or decline. Sorghum is a versatile crop, which can be used as a grain, forage, or sweet crop. It is one of the top five cereal in the world. Sorghum is believed to have originated in Africa; however, presently, the US is the largest producer of sorghum globally. It has a lower feed quality than maize. One of the trends emerging in the global sorghum market, which will help the market to grow during the forecast period, is the increasing use of sorghum as an ingredient in food and beverages by various players. In May 2016, Jersey Spirits Distilling launched James F.C. Hyde Sorgho Whiskey. “In April 2016, Guinness Ghana Breweries launched a new drink produced with about 70% sorghum sourced locally. Many players are also launching sorghum breakfast cereal as the grain is becoming popular among consumers as a breakfast option,” according to Manjunath. Players operating in the market are increasingly engaging in mergers and acquisitions (M&As) to increase their market share and to gain access to new products and technologies. Strategic M&As will also help vendors to increase their revenue stream and to consolidate their positions in the market in the long run. In June 2016, Chromatin acquired the US-based sorghum seed supplier Kirkland Seed. Kirkland Seed provides forage sorghum seed to growers and distributors in North America. In May 2016, S&W Seed announced the acquisition of the assets and business of SV Genetics, which is based in Australia and provides hybrid sorghum and sunflower seed germplasm. With the growth of e-commerce businesses worldwide, vendors now have the potential to increase their profitability. E-commerce accounts for approximately 12% of the world’s retail trade. Online and e-commerce channels support both business-to-business (B2B) and business-to-consumer (B2C) operations. The average amount of money spent online per transaction and the number of transactions that take place online are on the rise globally. The increase in the number of internet users and the "buy it now" attitude of these users are contributing to the growth of this retail channel. Become a Technavio Insights member and access all three of these reports for a fraction of their original cost. As a Technavio Insights member, you will have immediate access to new reports as they’re published in addition to all 6,000+ existing reports covering segments like food service, alcoholic beverages, and non-alcoholic beverages. This subscription nets you thousands in savings, while staying connected to Technavio’s constant transforming research library, helping you make informed business decisions more efficiently. 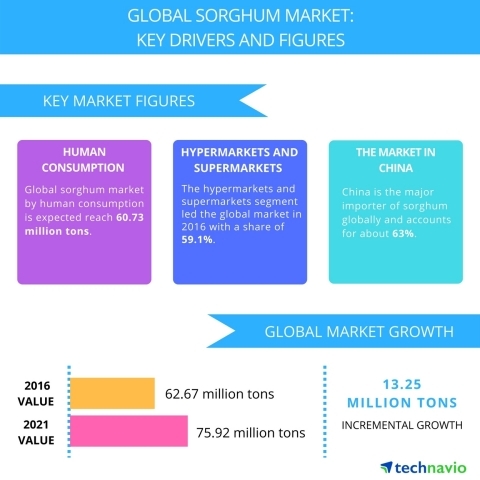 Technavio’s latest report on the global sorghum market provides an analysis on the most important trends expected to impact the market outlook from 2017-2021.